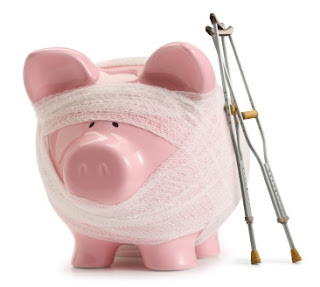 Finance Ideas 4u: How Does an Injury Affect My Personal Finances? How Does an Injury Affect My Personal Finances? An injury is awful for a multitude of reasons. Most people think immediately of the pain that’s involved. For example, if you’ve broken your wrist then people will usually think only of the pain you’re experiencing there. They don’t often think about the further implications that come with an injury. The physical pain isn’t always on the forefront of the mind of the person who has been injured. An injury can carry a massive financial cost. Even one that appears minor or doesn’t need surgery requires quite a lot of funding. And it’s those things that are usually on the mind of someone who has been injured. After all, pain is (usually) temporary. But money you have to spend or otherwise lose isn’t going to come back when the injury goes away! So what are the biggest financial effects that someone is likely to feel when they’ve had an injury? We’re going to take a look at three of them. If the injury is bad enough to prevent you from working, then you’re likely going to experience a loss of income. People often forget that about time off from work! They’ll say things to you like “At least you get to spend a few weeks off from work!”. But the reason you work is to get money, and if you’re not working then you don’t get money! For some people, things work out okay. If it’s a job they can do at home, then they may be able to avoid a lack of pay. But if the injury actually prevents you from doing any work full-stop, then this isn’t an option. Some companies continue to pay employees when they’re off injured, but this is rare. If the injury was the fault of someone else, then you should be taking legal action. (Unless it was a friend and you don’t want them to suffer financially for it!) If it was caused by an employer’s negligence or by the misbehavior of someone else, then you’re likely entitled to compensation. The problem for many people is the upfront cost of taking action. It’s true that this can be included in the financial strains brought about by an injury. But these costs aren’t usually as high as people think. And if you work with good personal injury attorneys and stick it out, the compensation will be worth it. This is the most immediate worry for a lot of people. If you’re not insured, then you could be looking at some devastating costs if your injury is serious. If surgery is required, then that is likely to be the biggest expense. Most of the time, an injury doesn’t require such drastic action. But they often require, at least, visits to physicians and ongoing prescription medicines. These things aren’t free, either! The best way to offset these costs are to have been insured in the first place. This isn’t possible for everyone, though. If this is a concern, you should look into getting any help you can to pay for medical insurance.